Morris writes that “Proclaiming racist theories contemptible is not enough. If we really want to reject them, and to conclude that people (in large groups) really are much the same it must be because racist theories are wrong, not just because most of us today do not like them” (pp. 50–51). 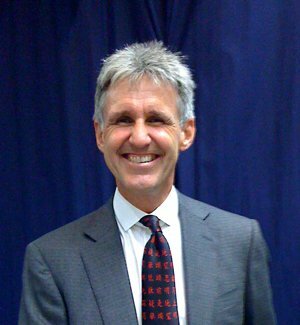 A central proposition of his book is that the falsification of the multiregional theory of human evolution by studies of mitochondrial DNA, which supports the “out of Africa” single origin theory of human evolution, debunks any notion that White racial traits played a role in the rise of the West. For Morris, it is axiomatic that “If modern humans replaced Neanderthals in the Western Old World and Homo erectus in the Eastern regions without interbreeding, racist theories tracing contemporary Western rule back to prehistoric biological differences must be wrong” (p. 70). He acknowledges that modern Eurasians share 1 to 4 percent of their genes with the Neanderthals “but everywhere from France to China it is the same 1 to 4 percent.” He notes that other racial groups like modern Africans have no Neanderthal DNA, but that “the implications of this are yet to be explored” (P. 60). 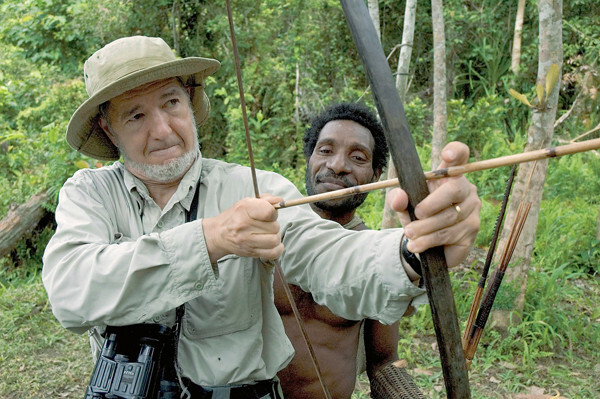 Unfortunately for Morris, the single origin “out of Africa” theory of human evolution in no way undermines the case for the existence of important racial differences in physical and psychological traits — including general intelligence as measured by IQ tests (which Morris completely and egregiously ignores). 40,000 years of differential evolution was enough to create the obvious physical differences between the races (skin, eye and hair color, skull shape etc. ), and it is implausible that selection pressures for physical traits existed in isolation from selection pressures for psychological and behavioral traits like intelligence. Indeed, the premier psychologist researching the biological origins of race differences in IQ and in life history strategy, J. Philippe Rushton, has been a prominent advocate of the out-of-Africa theory of human origins (e.g., in his book, Race, Evolution and Behavior; see here). The countries in sub-Saharan Africa remain backward today, compared with third-world countries on other continents. Most of them have largely discarded the democratic institutions bequeathed them by the Europeans countries that once ruled them, and on virtually every measure of social, cultural, or economic well-being they rank at the bottom. Countries such as Angola, Gabon, Zimbabwe, Guinea, and Uganda are separated from each other by thousands of miles; they differ in topography, climate, language, religion, and history. The only factors they have in common are race and the low average intelligence of their inhabitants. (Michael Hart, Understanding Human History: An analysis including the effects of geography and differential evolution, Washington Summit Publishers, Augusta GA, 2007, p. 111). Here Morris assumes a strict genetic determinism that few race realists have ever accepted. Genes and environment have always interacted to determine the fate of nations and civilizations (the disruption caused by natural disasters and disease pandemics like the Black Death spring to mind). To maintain that, because the rise of the West (when compared to the Far East) did not occur in a strictly linear progression, advantageous European racial traits must not exist, is absurd. Europeans have, according to the abundant data Morris shamefully ignores, evolved higher intelligence than any other racial group else except for East Asians (who have higher visual-spatial intelligence but lower verbal intelligence than Europeans). Morris deceptively uses “the East” (meaning China and Japan) as his historical plumb line of comparison with the West on measures of social development. However, he neglects to tell us when exactly the West slipped behind sub-Saharan Africa, the Americas, South-East Asia, Australia or Oceania in the various measures of social development. Then again, that, to put it mildly, was always going to be a tough job. Note how Morris lumps together the relatively sophisticated Chinese with the comparatively backward Australian Aborigines, as if Europeans made no real distinction between these racial groups. European anthropologists certainly did speculate whether East Asians evolved from Homo erectus (a theory favored until very recently by the Chinese themselves), but few regarded them as necessarily inferior to Europeans on that basis. If they made such a value judgment it was based on a comparison of the civilizational attainments of the Chinese compared to the West at particular points in history. In fact, throughout most of European history the Chinese and Japanese were held to represent a superior human type. Hart points out how: “In the 19th century, when European explorers first entered the ‘secluded zone’ of sub-Saharan Africa, they were struck by how extremely primitive the tribes in the region were. This was not because the Europeans were blinded by ethnic chauvinism. When European traders had reached China, they had brought back glowing accounts of Chinese civilization: The Chinese might be heathens, but there was no disputing their wealth, nor the quality of their engineering skills, nor the volume of their literature” (Hart, Ibid, p. 19). Morris, like Diamond, is eager to show there is no genetic component that might explain how the Europeans became far more advanced technologically than the inhabitants of sub-Saharan Africa, the Western Hemisphere, South-East Asia, and Australasia. Diamond states in Guns, Germs and Steel that the idea that there are genetic factors which cause Europeans to be more intelligent (on average) than Australian Aborigines is morally loathsome. The clear anti-White agenda of Diamond (who is Jewish) is revealed by the fact that two pages after making this statement he informs us that, as a result of natural selection, the aborigines of the New Guinea highlands are, in all probability, genetically superior to Europeans in mental ability. The real problem, however, with the Guns, Germs and Steel thesis, is that the facts refute the theory, particularly when applied to a comparison between sub-Saharan Africa and Mesoamerica. Hart notes how the geographic factors mentioned by Diamond strongly favored sub-Saharan Africa over Mesoamerica — meaning that civilization should have begun there earlier, and it should have progressed more there (prior to the European expansion of modern times) than it did in Mesoamerica. Sub-Saharan Africa had at least five useful wild cereal crops to Mesoamerica’s one, and sub-Saharan Africa possessed many potentially useful farm animals such the wild ancestor of domestic cattle, as well as sheep and goats had spread south of the Sahara by four thousand years ago, while Mesoamerica did not have a single large domesticable animal. Despite sub-Saharan Africa’s many advantages, by AD 1000, Mesoamerica was far more advanced than sub-Saharan Africa was, or ever had been. Hart notes that: “Mesoamericans had originated writing on their own, had constructed many large stone structures, and had built large cities (rivaling any existing in Europe, and far larger than any in sub-Saharan Africa). Furthermore, the Mayan achievements in mathematics and astronomy dwarf any intellectual achievements in sub-Saharan Africa” (pp. 176–177). Of course, even if the Diamond thesis is partly true, it does not prove that there is no genetic component to the respective civilization-building capacities of the different racial groups, and to the startling success of the West. Not that this obvious point would matter to Morris — whose thesis is so distorted by confirmation bias that he does not even deign to mention the voluminous data confirming the existence of racial differences in IQ. Nor does he deal with theories linking the rise of the West to Western individualism, either as a cultural variant (Ricardo Duchesne) or as resulting from a unique evolutionary history as northern hunter-gatherers (Kevin MacDonald). Likewise, he has no time for any suggestion that Western culture is better than other cultures. In speculating about the future, Morris sees the global balance of power shifting, over the course of this century, from the West to the East. Given his oft-stated refrain that “people are much the same wherever we find them,” and his apparent lack of any racial feeling, he seems unconcerned about what this—not to mention mass Third World immigration to the West—may mean for the future of White people. He is more concerned that this immigration be managed successfully, and that environmental problems, nuclear proliferation, and global food shortages be dealt with effectively at a global level. “The 21st century,” he asserts, “is going to be a race between worldwide transformation, and worldwide catastrophe, each on an unimaginable scale. Whichever wins out, the next 100 years are likely to bring more change than the previous 100,000” (p. 36). 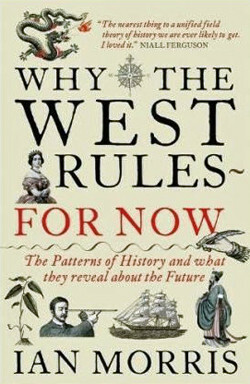 Ultimately, the purpose of books like this, which on an intellectually flimsy neo-Boasian pretext, proclaim Europeans to be no better than anyone else, is to erode the racial and cultural self-esteem of White people in order to hinder White ethnocentrism — and thereby allow the White dispossession that is part and parcel of the multicultural project to proceed apace and unchallenged. The flip-side of this tacit objective is, of course, to bolster the self-conception (and the sense of self-righteous historical grievance and entitlement) of non-Whites. You will search long and hard for books by Jews, Asians, or Africans that seek to deconstruct their group’s supposed achievements and claims to uniqueness. On the contrary, non-White ethno-triumphalism is a well-established sub-genre of the culture of critique that flows out of ethnic studies departments of Western universities. Conversely, books like Why the West Rules…For Now are the inevitable result of the successful establishment of a perverted system of incentives in the world of academia that rewards White scholars like Morris who harm the interests of their own people.